Scroll down to see the most affordable biology degrees, as well as info on the different types of biology degrees and biology program accreditation. The Francisco J. Ayala School of Biological Sciences at UC Irvine offers Bachelor of Science degrees in biochemistry and molecular biology, biological sciences, biology/education, developmental and cell biology, ecology and evolutionary biology, human biology, microbiology and immunology, and neurobiology. Master of Science degrees are available in three areas - biological sciences, biotechnology management, and biological sciences and educational media design. The MS in Biotechnology Management program is offered jointly with the Paul Merage School of Business and the Henry Samueli School of Engineering. There is also a Doctor of Philosophy in Biological Sciences degree available. Biology undergraduates can apply for a number of scholarships, including the Brian Atwood Scholarship, Robert H. Avnet Memorial Scholarship, and the Edward Mittelman Memorial Fund Scholarship. Hands-on learning is a hallmark of the Biological Science programs at the University of Minnesota of Duluth. The Department of Biology offers a Bachelor of Science in Biology and Cell and Molecular Biology and a Bachelor of Arts in Biology through the College of Arts and Science. Bachelor of Science in Biomedical Sciences and Biochemistry is offered through interdisciplinary departments. The school's Biology Specimen Collection has cataloged more than 50,000 species while the Olga Lakela Herbarium includes 48,000 botanical specimens. Field work can be conducted at the UMD Research and Field Studies Center, a 114-acre site, or the Bagley Nature Area, a 50-acre site that includes Rock Pond and forests. Departmental scholarships include the Warren Scholarship and Niemi Scholarship. Texas A&M offers a wide range of degrees in the biological sciences. These include bachelor's degrees in Biology Microbiology, Molecular and Cell Biology, Biochemistry, Biophysics, Biomedical Sciences, and Zoology. Advanced degree options include a Ph.D in Biochemistry and Biophysics, or a Master or Ph.D of Biomedical Sciences. Students seeking a doctorate in Biology can specialize in Molecular, Cellular and Developmental Biology, Ecology and Evolutionary Biology, Genetics, Genomics and Bioinformatics, Neurobiology and Behavior, Microbiology, Plant Biology, Biological Clocks, and Physiology and Systems Biology. Texas A&M is a leading research institution in the biologic sciences, and students will find modern facilities, up-to-date equipment, and many research opportunities. The Biology Department offers undergrads academic credit for working on faculty research. Rutgers University offers a Bachelor in Cell Biology and Neuroscience with two options, one designed for students who plan to go on the medical school and one for students who want to earn a graduate degree in cell biology. The university also offers undergraduate programs in Biochemistry and a Bachelor and Master of Microbiology, as well as a Bachelor in Molecular Biology and Biochemistry, and five Ph.D. programs in Molecular Biosciences. With so many departments involved in the life sciences, biology students will find many opportunities to become involved in research. Rutgers offers summer research fellowships and internships in research, and students can also earn academic credit for research they perform. The University of North Carolina-Chapel Hill offers 14 interdisciplinary Ph.D. programs under the umbrella of the Biological and Biomedical Sciences Program, including advanced training in biological research in areas of Biology Biochemistry and Biophysics, Bioinformatics and Computational Biology, Cell and Development Biology, Cellular and Molecular Physiology, Genetics and Molecular Biology, Microbiology and Immunology, Molecular and Cellular Pathology and Neurobiology. Master's degrees are offered in Biology, Biochemistry, Biostatistics and Neurobiology, with Bachelor's degrees in Biology and Biostatistics. BS, MS and Ph.D. degrees are offered in Bioengineering. The school is involved in a number of cutting-edge research projects and boasts state-of-the-art laboratory facilities. The Biology Without Borders program connects students with enriching internships, volunteer opportunities and student organizations. The Bachelor of Science in Biology at UCLA is offered through the Ecology and Evolutionary Biology Department at the College of Life Sciences. The curriculum provides students with a broad knowledge of biological and related sciences and includes coursework in biochemistry, human genetics, physiological science, and atmospheric and oceanic sciences. Master of Science (MS) and Doctor of Philosophy (PhD) degrees in biology are also available. MS students are required to take the departmental written qualifying exam during their initial year in the program and can either write a thesis or take a comprehensive examination in order to graduate. All graduate students receive up to $26,000 in financial support for five years in the form of teaching or research assistantships and fellowships. Top-notch students working toward a BS in Biological Sciences at UIC can qualify for four departmental awards worth between $500 and $1,000. Neuroscience and Biochemistry majors qualify for separate awards. To get help along the way, undergrads should head to the Science Learning Center, where they can attend peer-led study groups or free tutoring sessions. Those aiming for spots in the MS or PhD programs in Biological Sciences will be interested in the teaching and research assistantships, most of which are half-time positions; not all come with tuition and fee waivers, but stipends are standard. Baruch College offers Bachelor of Biological Sciences that is flexible and allows students to consult with a faculty adviser to design a program of study that will allow them to prepare for graduate studies or to help them prepare for a health-related profession. Classes are small, and outstanding students have the opportunity to assist faculty members with research, which can sometimes result in academic credit or count as an independent study course. Another option is for a student to design an ad hoc major in the natural sciences, such as a pre-professional program for those planning to enter medical school or an environmental studies program. Vassar students interested in life sciences can pursue a BA in Biology or Biochemistry. Because the department values undergraduate research, throughout the year, students can approach faculty for paid research and lab assistantship positions. During the summer, more than a dozen Biology students are selected to participate in the Undergraduate Research Summer Institute, a 10-week paid internship that concludes with a research symposium. That symposium typically leads to fresh faculty-student research. To help cover travel costs for research presentations, students can apply for $500 in funding from the school's Center for Collaborative Approaches to Science. UC Riverside's Department of Evolution, Ecology, and Organismal Biology runs a BA/BS in Biology and provides volunteer research positions to majors. Some opportunities include fieldwork at one of the five UC-owned nature reserves in San Bernardino and Riverside counties. Master of Science and PhD seekers in the department typically receive fellowships and/or teaching and research assistantships. Those who earn the latter receive a partial fee remission and health insurance depending upon their weekly workload. The Moore Endowed Fund, Loomer Endowed Award in Biology and Shoemaker Graduate Fellowship all go to graduate scholars. The Division of Biological Sciences at UC San Diego offers Bachelor of Science degrees in the following fields: general biology, biochemistry and cell biology, ecology, behavior, and evolution, biology with a specialization in bioinformatics, human biology, microbiology, molecular biology, and physiology and neuroscience. Biology undergraduates can complete a Master of Science (MS) degree within three to five quarters after earning their BS degree if they qualify for the contiguous BS/MS program. Two Doctor of Philosophy (PhD) programs are available; one is offered with the Salk Institute and another is a joint PhD program with the San Diego State University. Doctoral students receive an annual stipend. Eureka Scholarships (up to $5,000) are available for undergraduates who wish to take advantage of research opportunities. Students can choose from a variety of degrees related to the field of Biology at the University of Minnesota-Twin Cities. These include Bachelor of Science degrees in Biochemistry, Biology, Microbiology, Plant Biology, Cell Biology; a Bachelor of Arts in Biology, and Society and Environment; Bachelor of Biomedical Engineering; Master's of Biochemistry, Molecular Biology and Biophysics, Biological Sciences, Biomedical Engineering, Biostatistics, Conservation Biology, Molecular, Cellular, Developmental Biology and Genetics, and Microbiology, Immunology and Cancer Biology; and Doctoral degrees in Biomedical Engineering, Biomedical Informatics and Computational Biology, Biophysical Sciences and Medical Physics, Biostatistics, Microbiology, Immunology and Cancer Biology, Molecular, Cellular, Developmental Biology and Genetics, Conservation Biology, Plant Biological Sciences. Scholarships include BSAS Freshmen Merit Scholarship ($1,000) and the Burbee Memorial Scholarship. The School of Arts and Sciences at Rutgers University offers a Bachelor of Arts in Biological Science, and the School of Environmental and Biological Sciences offers bachelor's degrees in numerous biological sub-fields like microbiology, plant biology, entomology, biochemistry and biotechnology. Additionally, graduate programs are available in biological sub-fields like plant biology, microbial biology, entomology and ecology. The B.A. in Biological Sciences requires 71 major credits, including 47 credits of life science core courses and 24 credits of life science electives. Students who choose a sub-specialty like plant biology, for example, complete 19 to 21 credits of required life and physical science core courses and 49 to 60 credits of major-specific courses. The graduate program in microbial biology includes both M.S. and Ph.D. degrees. Undergraduate biology majors at Buffalo State can earn a Bachelor of Science in Biology Education or a Bachelor of Arts in Biology with a concentration in integrative biology, aquatic biology, or biotechnology. Biology majors can also create a pre-med track if they want to go to medical or veterinary school. The university also offers a Master of Arts in Biology, a 30-credit graduate program that allows students to specialize in an area such as ecology, evolution, or biotechnology by careful selection of up to 26 elective credits. Master's candidates have the choice of completing a thesis or taking a comprehensive exam. Scholarships open to biology majors include the Kenneth Malinowski Scholarship (up to $5,000), awarded annually. The Department of Biological Sciences at SUNY Oswego offers majors in biology and zoology. The Bachelor of Arts in Biology or Zoology requires students to earn at least 62 major credits, while the Bachelor of Science in Biology requires at least 75 major credits and the B.S. in Zoology requires at least 77 major credits. Facilities available to students in the Department of Biological Sciences include the Rice Creek Field Station, which is equipped with labs, a lecture room, and 300 acres of fields, forests, ponds and streams students can use for research. The college also has a greenhouse, herbarium and molecular biology and biochemistry lab. Departmental scholarships include the Martin Torok Memorial Scholarship for a biology or zoology major. The University of California Berkeley is the No. 4 school in the nation for biological sciences at the graduate level, according to the 2018 rankings by U.S. News, which places the school at No. 1 for molecular biology and ecology/evolutionary biology. The Division of Biological Sciences at Berkeley has two departments-integrative biology and molecular and cell biology - and more than 100 full-time faculty. Degrees are available at all levels, from bachelor's to Ph.D., in fields ranging from health sciences to genetics. The Department of Biological Sciences is associated with organizations including a cancer research lab, neuroscience institute, and botanical gardens, and even undergrads are encouraged to undertake independent research studies. The University of California Davis is one of the Top 20 schools for the study of biological sciences, ranking No. 19 on the 2018 U.S. News listing of Best Grad Schools. UC Davis is one of only four universities in the U.S. to have a College of Biological Sciences, which has about 6,000 undergraduate and graduate students. Undergrads can choose from nearly a dozen majors - from exercise biology to marine and coastal sciences. Graduate students can join one of eight groups in fields such as genetics or plant science. The college administers a variety of need- or merit-based endowed scholarships, such as the Alden Crafts Scholarship for botany or plant science majors and the Conn Scholarship in Biochemistry. With over a dozen full-time faculty, Westfield State's Biology Department is an active one, offering both full-time and part-time bachelor degrees alongside a minor. Those looking to teach science at the high school level can incorporate Massachusetts licensure into their degree program as an undergraduate or append it as post-baccalaureate study. (The school also has a Masters in Biology with initial licensure that falls under the Master in Education program.) The department further reaches out to science teachers through its annual STEM workshop series, and students maintain a Biology Club. Students majoring in biology at Barnard may choose to major in general biology, cell and molecular biology, physiology and organismal biology, or ecology and evolutionary biology. All majors are required to take three upper-level biology lab courses, or they may take the year-long guided research and seminar sequence which counts as two lab courses. Biology majors must complete a senior capstone experience, which can be either the one-semester senior seminar or a year-long senior thesis research and seminar. Facilities available to the Biology Department include the Arthur Ross Greenhouse research facility, Black Rock Forest experimental forestry station, Core Genetics facility, and a digital microscopy lab. The department offers undergraduate students jobs as teaching assistants, lab assistants and supplemental instruction leaders. The Biology Department at SUNY Oneonta is known for ecology and environmental science, a reputation enhanced by its Biological Field Station in Cooperstown, New York, with specialized laboratories, docks, boats, sampling equipment, and thousands of acres of forests and ponds. Graduate students can earn a Master of Science in Biology or in Lake Management. The lake management program has two tracks, including a professional science master's, and qualifies graduates for certification as a Certified Lake Manager. Undergrads can take a general biology track or specialize in ecology and field biology, biomedical sciences, or cell and molecular biology. Undergrads who want to teach biology may qualify for the Noyce Scholar program, worth about $20,000 over their junior and senior years. The Biology Department at Appalachian State University has 23 research laboratories and other state-of-the-art research facilities that allow faculty and students to conduct investigations into everything from marine ecology to virology. Undergrad majors can choose a number of specialties to concentrate in. Those seeking a Bachelor of Arts in Biology choose to specialize in Cellular or Subcellular; Evolution or Ecology or Environment; Anatomy or Physiology; or Biodiversity. Bachelor of Science students can receive a degree in Ecology, Evolution and Environmental Biology; Cell/Molecular Biology, or in teaching biology in secondary schools. There is also a pre-health professions option. The university also offers a Master of Science in Biology. Departmental scholarships include the Biology Alumni and Faculty Emeriti Endowed Scholarship ($800). Students entering the Biology Department at the University of Massachusetts-Amherst build the foundation of their academic program in the Biology Intensive Orientation Session. The Biology Department offers a Bachelor of Science in Biology, and Master of Science or Ph.D. degree in Molecular and Cellular Biology; Organismic and Evolutionary Biology; and Plant Biology. The school also offers a Bachelor of Science or Bachelor of Arts, Master of Science and Ph.D. Degrees in Biochemistry and Molecular Biology or Microbiology. The Master's programs are exclusively for graduates of UMass or other colleges in the Five College consortium. The school also offers a Certificate Program in conjunction with an undergraduate degree and a Post-Baccalaureate Certificate in Biomedical Engineering. The biology program leading to a Bachelor of Elective Studies at St. Cloud University allows students to take classes in biology and chemistry and select electives to create a unique degree program that prepares them for research, fieldwork or education. The university also offers a Bachelor of Biochemistry, a Bachelor of Biomedical Science, and a Bachelor of Biotechnology. Grad students can earn a Master of Ecology and Natural Resources or a Master of Cell and Molecular Biology. Research facilities include a greenhouse, herbarium, cell tissue lab, and DNA sequencing and analysis labs. Departmental scholarships include the Gladys Tirrell Nelson and Dr. N.B. Nelson Biology Scholarship ($1,000) and the Jerry Wolff Biology Graduate Student Enrichment Fund (amounts vary). Michigan Technological University's Department of Biological Sciences offers Bachelor of Science, Master of Science and Doctor of Philosophy degrees in biological sciences. Bachelor of Science degrees in biochemistry and molecular biology, bioinformatics and medical laboratory science are also available. The B.S. in Biological Sciences allows students to concentrate their studies in general biology, ecology, secondary education or pre-health professions such as medicine, dentistry, physical therapy, pharmacy, veterinary medicine and chiropractic medicine. Students working toward an M.S. in Biological Sciences develop their research skills and write a thesis over the course of two years. The PH.D. program takes three to six years to complete, during which time students create a research question, perform research, write a thesis and take comprehensive examinations. An accelerated, five-year B.S. to M.S. program in biological sciences is also available. Wayne State College Department of Life Sciences provides undergraduate students opportunities to take part in faculty research as well as engage in service learning opportunities and extracurricular activities. The school offers a Bachelor of Arts and Bachelor of Science in Biology. Those interested in teaching at the high school level can major in Education with endorsement in Biology. The school boasts 100 percent employment of recent Biology education graduates. Students have the option to choose electives to complement the Biology core curriculum and their own interests. The A. Jewell Schock Natural History Museum provides an ecology study area, and is currently being expanded. Scholarships include the Rohrberg Memorial Scholarship, Hall Memorial Scholarship, and Varilek Scholarship. Students who earn a Bachelor of Bioscience at Farmingdale State are prepared for one of the many different kinds of jobs in the field of bioscience. Others continue on to earn a professional degree. The program combines theory taught in class with hands-on practice in a laboratory setting. By taking a set of technical electives, students can prepare for a job in a particular segment of the bioscience industry, including bioinformatics, biopharmaceuticals, bioscience laboratory research and analysis, forensic DNA technology, or admission to graduate school. Departmental scholarships include the Dr. and Mrs. Keen Bioscience Undergraduate Research Scholarship ($1,000), the Forest Laboratories Inc. Scholarship ($1,000), and the Dr. Frank C. Pellegrini Memorial Scholarship ($1,000). The Bachelor of Science in Biology program at CSU Long Beach offers a general option, plus three additional options in biology education, organismal biology, and molecular cell biology and physiology. There are also Bachelor of Science programs in marine biology and in microbiology. Certificate programs are available in biomedical art and in biotechnology. Two Master of Science (MS) programs are currently offered - MS in Biology and MS in Microbiology. Along with other students of the College of Natural Science and Mathematics, biology majors can apply for a number of departmental scholarships, including the Carl E. Riley Endowed STEM Award ($1,000 to $2,000) and the G2 Software Systems Scholarship ($5,000) for students interested in careers in technology and science-based industries. Iowa State offers a Bachelor of Biology degree both through its College of Liberal Arts and Science and its College of Agriculture and Life Sciences, which have slightly different requirements. Undergrad biology majors can specialize in human health, animal health, ecology and conservation biology, evolution and biodiversity, or cell molecular development. Other options for students interested in biology are a Bachelor, Master, or Ph.D of Microbiology, a Bachelor in Biochemstry, Biophysics or Agricultural Biochemistry, or a graduate degree in Bioinformatics and Computational Biology, Ecology and Evolutionary Biology, or Veterinary Pathology. Available scholarships include the Rob Stupka Memorial Scholarship ($1,000), the Paul and Marge Hartman Freshman Scholarship ($750), and the Martha Vincent-Ridge Scholarship in Pre-Veterinary Microbiology ($1,000). At the University of Florida, the Biology major is administered jointly by the College of Agricultural and Life Sciences and the College of Liberal Arts and Sciences. The undergraduate program draws courses from 17 academic departments. Bachelor of Biology options include tracks for Pre-Professional Studies, Applied Biology, Integrative Biology and Biotechnology, plus degrees in Botany and Zoology. Master's and Ph.D.s are offered in Botany and Zoology with specializations in Ecology, Evolution, Behavior, Development, Comparative and Environmental Physiology, Molecular Biology, Neurobiology, Genetics, and Phylogenetics. Biology programs are associated with marine science laboratories, ecological science laboratories and other specialized facilities. Departmental scholarships include the Winona Jordan Undergraduate Scholarship (amount varies) and the Lewis and Varnia Vaughn Fellowship in Orchid Biology ($5,000). Berea College offers a Bachelor of Arts in Biology and an undergraduate biology minor. The B.A. in Biology requires six credits of core courses in subjects such as genetics, zoology and botany. B.A. students are also required to complete a one-credit capstone course in evolution. The biology minor requires the completion of five courses, two of which must be at the 200-level or higher. The Biology Department offers qualified students the opportunity to act as laboratory and teaching assistants. Biology students also have the opportunity to undertake faculty-directed research and independent study experiences. Additionally, students interested in pursuing a career in medicine have the opportunity to participate in the Pre-Medical / Dental Club. Alfred University's Division of Biology offers an undergraduate biology major and undergraduate minors in biology, biological anthropology and biomaterials engineering. The Bachelor of Arts in Biology requires 26 credits of foundation and core courses in subjects like genetics, biostatistics, biochemistry, cell biology, and community and systems biology. Students also complete 12 credits of specialization courses, with specializations available in cell/molecular biology or organismal/ecological biology. The Division of Biology also offers its students the opportunity to participate in the Alpha Helix Biology Club, American Red Cross Blood Drives and special guest lectures in biology. Biology students are eligible for several scholarship opportunities, including the $500 Brenda Bernstein Butner Award in Botany, the $1,000 University Advisory Committee for the Health Professions Scholarships and the Diana Mossip Memorial Scholarship. The College of Natural Science at Michigan State offers about a dozen degrees in the biological sciences at the bachelor's level, including degrees in Biochemistry and Molecular Biology; Biotechnology; Environmental Biology with specialties in Plant Biology, Microbiology or Integrative Biology; Genomics and Molecular Genetics; and Human Biology. The offerings at the master's and Ph.D. level are equally as broad. As a major research university, the school is equipped with state-of-the-art labs and instrumentation, and graduate students help with research. The university is associated with more than a dozen research centers, including the Kellogg Biological Station and the Center for Microbial Ecology. Available scholarships include Elsie M. Jackson Endowed Scholarship and the Ramon F. and Dorothy F. Rolf Scholarship (amounts vary). Queens College offers bachelor and master's degrees in biology and participates in the biology Ph.D. program through the CUNY Graduate School. Undergrads can earn a Bachelor of Arts in Biology or Biology Education. Biology majors must have at least 36 credits in biology and must take general and organic chemistry, and either calculus or biostatistics. Master's students have the opportunity to participate in faculty research that is funded by organizations such as the American Cancer Society and the National Science Foundation The Ph.D. program allows candidates to specialize in: molecular, cellular, and developmental biology; evolution, ecology, and behavior; neurosciences; plant sciences; biochemistry; or earth and environmental sciences. Departmental scholarships include the Adele Gottschalk Scholarship (up to $1,000 per semester). The College of Agriculture and Life Sciences at Brigham Young University offers Bachelor of Science degrees in Biology and in Biology Education. Courses are also available for non-major students who want to complete the four-credit General Education requirement for Biological Science. Students pursuing the BS in Biology degree can choose from the following areas of emphasis: microbiology, zoology, neuroscience, environmental biology, human biology, and biotechnology. The BS in Biology Education degree offers two tracks. One track requires students to take an additional minor in science education and leads to two teaching endorsements - one in biology and another in the minor field of study. The second track is the Composite Biology Education track, which leads to an endorsement in biology only. Northwest Missouri State University offers Bachelor of Science and Master of Science degrees in Biology. Emphasis areas available to BS Biology students are biomedical sciences and cellular/molecular biology. MS students have the option of specializing in four areas - ecology, cellular/molecular biology, environmental science, and organismal biology. BS and MS degrees in biology education are available for students who plan to pursue a career as biology teachers after graduation. The undergraduate degree in biology also serves as a preparatory program for professional degrees in medicine, dentistry, occupational therapy, physical therapy, and veterinary medicine. Continuing Biology majors can apply for scholarship opportunities such as the Irene Mueller Biology Scholarship ($600) and the Fred C. & Grace E. Nelson Scholarship ($400). The Biology Department at the City College of New York grants a Bachelor of Science and Master of Science in Biology and offers a Ph.D. program in conjunction with the City University of New York. The department also has a combined bachelor's/master's program for students who are interested in pursuing research. The faculty specializes in fields such as neuroscience, cancer, and conservation biology, and students have the opportunity to participate in faculty research. The department presents weekly guest speakers during the academic year. The CCNY Biology Club organizes professional networking events, guest speakers, and social events for students. Departmental scholarships include the Sharon D. Cosloy Scholarship in Biology ($2,000) for a biology major who has participated in laboratory research. Undergrads at Hunter College who are interested in biology can earn a Bachelor of Arts in Biological Sciences with a concentration in Biophysics, Behavioral Neurobiology, or Bioinformatics, or they can enter a track for students who plan to teach elementary school. Hunter also offers an accelerated master's program in biological sciences that allows students to earn bachelor's and master's degrees in five years. Options in the accelerated program are a B.A/M.A. in Biological Sciences with a specialization in Biotechnology; B.A./M.S. in Biological Sciences/Environmental and Occupational Health; and B.S./M.A. in Medical Laboratory Sciences with a specialization in Biotechnology. In addition to the combined programs, Hunter grants biology M.A. degrees with specializations in Biochemistry, Biology Education, and Biotechnology and Public Health. Texas Woman's University offers a Bachelor of Science in Biology (also with research emphasis), a Bachelor of Science in Biology with Teacher Certification, a Master of Science in Biology, and a Ph.D. in Molecular Biology. The B.S. in biology degree is perfect for students who wish to pursue medical school, dental school, or veterinary school. Students may qualify for the Polly Crisp Scholarship for Pre-Med Women or the Scholarship for Science, Technology, Engineering and Math (STEM). Those who wish to teach biology may also pursue a teaching certification. Undergraduate students may take such courses as Molecular and Cellular Biology: Genetics and Inheritance as well as Pathophysiology. Graduate students may take such courses as Health Care Genetics and Advanced Cell Biology. Brooklyn College grants a Bachelor of Arts, Bachelor of Science, and Master of Arts in Biology. Undergrads can also enter a program that trains secondary school biology teachers; the joint program is offered by the Department of Biology and the Department of Secondary Education. Graduate students can pursue specialties such as cellular, molecular, developmental, and behavioral biology. Graduate students use the department's well-equipped labs for their thesis research, and the program prepares them for work in industry or academia. Graduate teacher training in biology is also offered. The Biology Department at Brooklyn College has received more than $5 million in research grants from the National Institutes of Health and the National Science Foundation. The biology program at Plattsburgh prepares students for careers in research, adolescent education, or for graduate school or professional school to become a doctor, veterinarian or dentist. Students can major in Biology, Biochemistry or Cytotechnology, a clinical specialty that involves analyzing tissue and cell specimens for abnormalities. The Cytotechnology program requires a 12-month clinical internship. Pre-med students majoring in biology work with an advisory committee that helps them to decide which courses are the best preparation for medical school and helps them with the medical school application process. Available scholarships include the Robert S. and Mary B. MacDonald Scholarship Fund ($1,200) for pre-med majors. The Department of Biological Sciences at the University of North Texas offers a Bachelor of Arts in Biology, a Bachelor of Science in Biology, a Biology (Life Science) Teacher Certification, a Bachelor of Arts in Biochemistry, a Bachelor of Science in Biochemistry, a Master of Arts in Biology, a Master of Science in Biology, a Master of Science in Biology (Teaching in the Life Sciences), and a Ph.D. in Biology. The bachelor's degrees are four-year degrees that are specifically meant to prepare students for professional programs such as medical school or careers in biological sciences. Scholarships available to biology students include the Floyd Schafer Memorial Scholarship, the Patricia Schmidlekofer Memorial Scholarship, and the Tad Lott Memorial Scholarship, among others. The California State University at Stanislaus gives students the option of pursuing a Bachelor of Arts (BA) or a Bachelor of Science (BS) degree in biological sciences. Students admitted to the BS program can choose from the following areas of concentration: general biology, biology education, ecology, organismal biology, or molecular and microbial biology. A student with a biological sciences major can qualify for an environmental sciences concentration by taking additional requirements in science (chemistry, computer science or physical sciences) and mathematics. The Wayne Pierce Scholarship (variable amount) is available to full-time biology majors who have completed at least eight units at the university with a satisfactory grade (C or better in all biology courses). Five scholarships are awarded each year. The Department of Biological Sciences at California State Polytechnic University Pomona offers Bachelor of Science degrees in biology, biotechnology, and environmental biology. Biology majors can pursue sub-plans in botany, general biology, microbiology, or zoology. Students who are planning a career as a secondary biology teacher are required to take a Single Subject Credential in Science from the Department of Education and pass the National Teacher Examination. There is also a Master of Science in Biological Sciences available. MS candidates can choose from several specialization options including developmental biology, animal physiology, evolutionary biology, medical bacteriology, and genetics. The department offers a number of scholarships to qualified students, including the Larry Dang Scholarship ($1,000) and the Karen Dundas Sorci Endowed Scholarship for Biology ($750). Biology is the stuff of life – literally. Whether they’re studying bacteria and viruses, or animals, plants, and ecosystems, biologists try to understand how biological principles affect our health, our natural environment, and our fellow organisms. They work as zoologists and botanists, pharmacists and biochemists, ecologists and teachers, putting science to use in an immensely practical way. But where do you start? Right here. 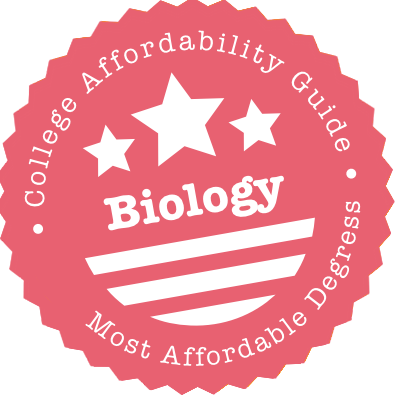 In our guide to affordable biology degrees, you’ll find info on degree choices, sample coursework, career options, and more. You’ll learn which level of education is right for you and what kinds of certifications and licenses you might need to consider. An associate’s degree in biology is a 2-year undergraduate program focused on giving students a strong foundation in biological science. Programs are offered by a wide variety of community colleges, junior colleges, and universities. A high school diploma or GED is required to apply. Since most entry-level positions in biology require a bachelor’s degree or higher, many students use the associate’s degree as a stepping stone to more education. If you’re interested in earning a BA or BS, make sure your associate course credits will be transferable to the school of your choice. Associate of Arts (AA) in Biology: Typically includes more theoretical courses than the AS. Associate of Science (AS) in Biology: Typically includes more “hard science” courses than the AA. Recommended for students interested in research or graduate work. Associate of Applied Science (AAS) in Biology/Biotechnology: Technical/specialized programs that are often designed for students who wish to go straight into the workforce after graduation. The curriculum for an associate’s degree in biology will focus on grounding you in basic scientific principles and skills. As such, you will usually be required to take classes in anatomy, physiology, chemistry, physics, and calculus. Depending on your interests, you may also be taking courses in animal biology, plant biology, ecology, genetics, microbiology, biotechnology, and biochemistry. Part of your training will take place in hands-on labs, where you will have the chance to analyze specimens, create experiments, and interpret data. Many AAS graduates find work as technicians. Depending on the job title, technicians may be required to collect specimens, prepare samples, perform tests in a lab or field setting, and/or monitor and maintain equipment. Biological Technician: Works alongside researchers and scientists in a laboratory or outdoor setting. Conservation/Environmental Technician: Works for federal, state, and local government agencies responsible for the conservation of parks and reservations. Medical/Clinical Laboratory Technician: Works alongside physicians and nurses in a medical setting. Research Assistant: Assists higher-level scientific researchers in a lab or in the field. You always have the option to find work as a technician while you save your next stage of education. A bachelor’s degree in biology is a 4-year undergraduate program that is designed to give students a comprehensive understanding of the field of biology. These programs are offered by a wide range of regionally accredited universities, colleges, and schools. A high school diploma or GED is required to apply. Many graduates use the BA or BS as the stepping stone to graduate work, a professional program (e.g. medicine, veterinary medicine, pharmacology, dentistry, etc. ), or a career in K-12 teaching. If you’re interested in becoming a middle school or high school teacher, look for schools that allow you to combine your BS in biology with a teacher training program. Bachelor of Arts (BA) in Biology: May include more theory-based and liberal arts courses than a BS. Bachelor of Science (BS or BSc) in Biology: May include more practical work and “hard science” courses than a BA. Recommended for students interested in research or graduate work. Many schools will allow you to choose a major or concentration in biology. We’ve listed some of the most common majors below, but there are more! Botany: The study of plant life and the role that it plays in the environment. Botanists often find work in agriculture, research, gardens, plant nurseries, and parks. Ecology/Environmental Studies: A macroscopic look at how humans, animals, plants, bacteria, physical forces, and other factors interact in an environment. Ecologists study issues such as climate change and sustainability, and work for a wide variety of public and private organizations. General Biology: A non-specific major that allows you to explore a wide variety of biological topics without committing to one in particular. This major can be a good choice for aspiring biology teachers. Marine Biology: The study of marine animals and plants, as well as the ocean’s ecosystem. You may have the option to pursue marine biology as a major or as a track in general biology. However, many marine biologists find that they need to complete graduate work in order to be eligible for jobs. Microbiology/Biochemistry: The examination of life on a cellular level. Microbiologists study the behavior of viruses and bacteria, organic and inorganic chemistry, and genetics and immunology. Unless they take up jobs as salespeople and administrators in the pharmaceutical industry, most microbiologists and biochemists pursue a master’s degree in order to work as a scientist. Pre-Medical/Veterinary/Pharmacy/Dental Studies: Some schools offer pre-medical or dental studies as a specific major or concentration within the biology degree. Others offer pre-med, pre-vet, pre-pharm, and pre-vet programs that include a large chunk of biological courses. Check with your academic adviser to see if the undergraduate program meets admission requirements for a professional school. Zoology: The study of animals and their specific ecosystems. Zoologists find work in zoos and wildlife parks. However, if you’re interested in research or management positions, you may need an advanced degree. Aspiring veterinarians often choose zoology as their undergraduate degree. Your coursework will, naturally, depend upon your choice of major. In the first couple of years, you will often follow the same curriculum as an associate’s degree, taking core courses such as anatomy, physiology, chemistry, physics, and calculus. A healthy proportion of your time will be spent creating experiments in labs, conducting fieldwork, and working in internships. As your degree progresses, you will be expected to focus more and more on your area of interest. For example, those interested in teaching biology may be required to take education and child psychology courses and complete supervised classrooms experiences. Many schools will ask you to complete a capstone project or thesis in your final year. With that being said, science is becoming an increasingly competitive field. If you’re interested in conducting your own research, being in charge of a team, or advancing up the ranks, you will probably need to earn a master’s degree or higher. A master’s degree in biology is a graduate-level qualification focused on research that generally takes 1-3 years to complete. Many candidates decide to pursue a master’s in order to qualify for better jobs, get more involved in research, or prepare for doctoral work. A bachelor’s degree in biology, biochemistry, or a closely related field is required to apply. Master of Arts (MA) in Biology: Often includes more theoretical courses than the MS. This is an option for students who work outside of the science field, but need training in biological topics. Master of Science (MS) in Biology: Often includes more practical courses than the MA. This is a common choice for students who wish to pursue research or teach at a university-level. Master’s programs in biology tend to be a mix of traditional coursework (e.g. molecular biology, ecology, biochemistry, etc. ), classes in your specific area of interest (e.g. marine sciences, herpetology, biomathematics, bioengineering, wildlife management, etc. ), and independent research. Because you are conducting your own experiments and presenting findings, you will also be expected to take courses in topics such as statistics and biological research methods. As part of your degree, you will be required to complete a thesis or capstone project based on original research. With your master’s in hand, you may also wish to pursue a PhD in biology, become a K-12 educator, teach at the junior college level, or apply for a professional school in order to become a doctor, dentist, veterinarian, or pharmacist. A PhD in Biology is the highest academic credential a biologist can pursue and typically takes 3-6 years to complete. A master’s degree is generally required to apply, although some universities offer combined master’s/doctorate programs. Most PhD candidates have solid experience in research work and applied biology. In the first years of a PhD in Biology, students are often expected to take a few upper-level courses in analysis, research skills, and theory. In subsequent years, they are usually free to work independently on a piece of original research (i.e. dissertation/thesis) in their area of interest. This may involve detailed fieldwork, long hours in the lab, and participation in fellowships/internships. Graduates with a PhD in biology are qualified to teach in universities and serve as department heads. They may also choose to tackle research in places such as the federal government, large private companies, hospitals, and independent research organizations. A certificate in biology is an academic qualification offered by a variety of universities and colleges. These short, specialized programs take around 6 months-1 year to complete. If you’re interested in using certificate course credits for a bachelor’s or master’s degree, make sure your credits will be transferable to the degree program of your choice. Undergraduate Certificate in Biology: Targeted at current undergraduate students who are interested in exploring the field of biology or prospective students who are thinking about earning an undergraduate degree. Graduate Certificate in Biology: Targeted at mid-career biologists who wish to expand their knowledge, improve their job prospects, and/or prepare for a master’s degree in the future. No matter which college or university you choose, we recommend it has regional accreditation. Regional accreditation is a “seal of approval” granted to institutions (e.g. non-profit and public colleges and universities) by one of six regional accrediting bodies (e.g. Southern Association of Colleges and Schools). Regional accreditation only applies to a college or university, not the degree itself. Unlike other subjects, there is no organization that specifically accredits biology programs. Do I Need Licensure or Certification? If you wish to work in certain areas of immunology, genetics, or health science, you may require a medical license. If you decided to become a medical lab technician, your employer may require ASCP board certification. As always, the best thing to do is to consult your academic advisers and mentors for advice. Even if professional certification is purely voluntary, you may wish to earn a certification in order to advance your career, network with peers, and increase your job prospects.